Did some of Syria’s WMDs come from America? “Chemical weapons used in Syria’s civil war.” Not long ago, that headline was the number-one story in the mainstream press. There was a considerable debate about whether Saddam hid some of his bio/chem weapons in Syria, to evade UN weapons inspectors. If he did, then is it possible the current situation in Syria has a few of its roots in the US? 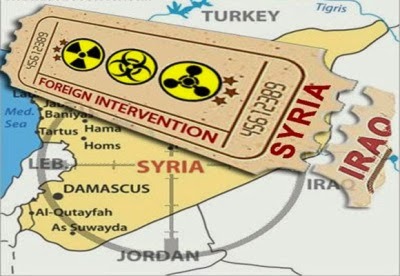 Is it possible some of Syria’s WMDs originally came from America? Because, you see, the US supplied Saddam with bio/chem weapons. In 1975, the US signed on to an international treaty banning the production, use, and stockpiling of biological weapons. Between 1984 and 1989, the CDC (Centers for Disease Control) sent Iraq at least 80 different biowar agents, including botulinum toxoid, dengue virus, and West Nile antigen and antibody. This information on the American Type Culture Collection and the CDC comes from a report, “Iraq’s Biological Weapons Program,” prepared by the Center for Nonproliferation Studies. The report contains ample reference citations. Then we have a comprehensive article by William Blum in the April 1998 Progressive called “Anthrax Export.” Blum cites a 1994 Senate report confirming that, in this 1985-1989 time period, US shipments of anthrax and other biowar agents to Iraq were licensed by…drum roll, cymbal crash…the US Dept. of Commerce. Blum also points out that a 1994 Pentagon report dismissed any connection between all these biowar agents and Gulf War Illness. But the researcher who headed up that report, Joshua Lederberg, was actually a director of the US firm that had sent the most biowar material to Iraq in the 1980s: the American Type Culture Collection. The names of US criminal companies: Mouse Master (Georgia), Sullaire Corp (Charlotte, North Carolina), Pure Aire (Charlotte, North Carolina), Posi Seal (Conn.), Union Carbide (Conn.), Evapco (Maryland), BDM Corp (Virginia), Spectra Physics (Calif.). It’s not much of a stretch to conclude that at least some of the bio/chem weapons Syria now possesses came from Saddam, and ultimately from the US. The US government isn’t going to shine a light in that dark hole—at least, publicly.